Palitaw is a native Filipino rice cake, whose name literally means "to float". And it is exactly the way this is cooked; the dough is ready when it floats. We had visitors over the weekend who prepared palitaw for merienda, and it was a nice treat as we haven't had palitaw for some time now. Mix the rice flour with water and knead into a soft dough. There is a bit of guesstimate here. If the dough needs more water, add a little at a time and continue kneading. Then take small portions of dough formed into balls, then flatten into discs. Set aside. 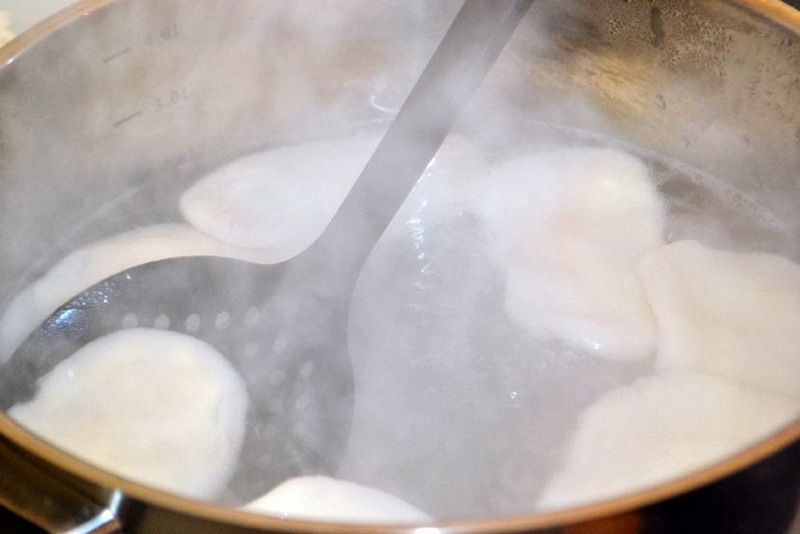 Boil enough water in a pot to submerge rice dough pieces then enable it to float when cooked. While the water is on a rolling boil, place a number of the dough discs, making sure they do not touch each other as they will tend to stick. The discs will get submerged, but will float when cooked. Remove the discs to drain. 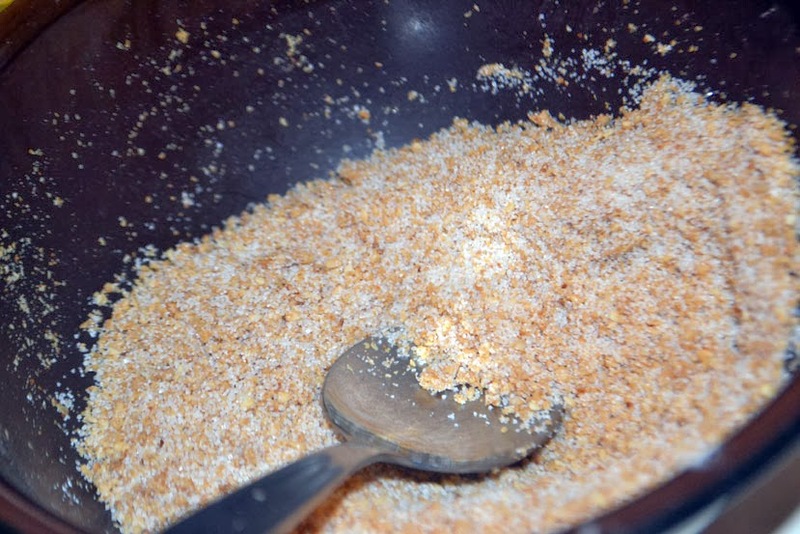 Mix white sugar with the toasted sesame seeds in a bowl. 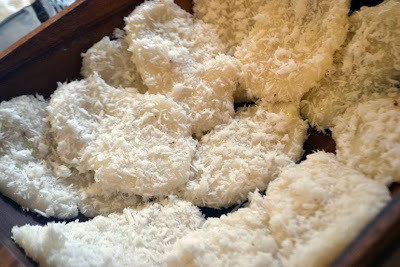 Finally, coat all sides of the cooked rice dough with grated coconut, then coat with the sugar-sesame seed mixture. 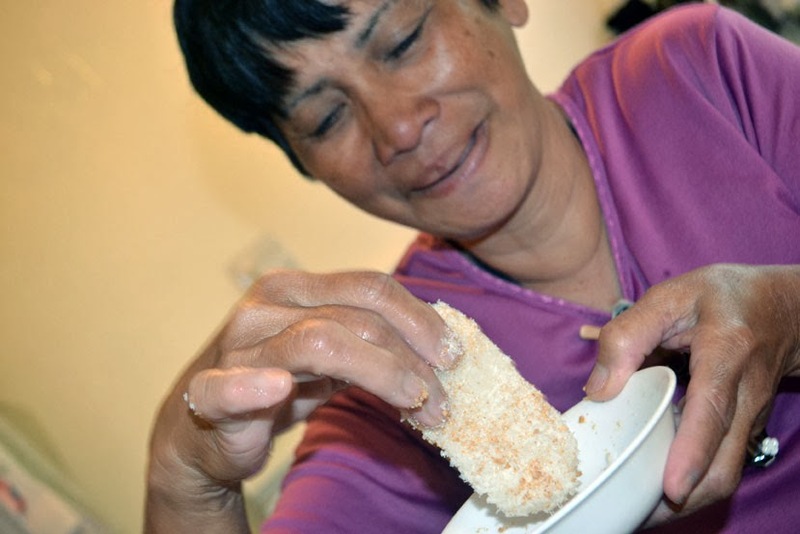 Or, you can serve the sugar-sesame seed mix separately (as in the case below, Mommy Connie got her own small bowl of sugar with sesame seeds so she can savour her palitaw using her bare hands!). Serve and enjoy. Thanks Mommy Connie for the fun merienda afternoon!